Power Requirements: Step-Through design allows you to easily get on and off the seat. The newly designed Comfort Curve® Seat provides exceptional comfort and is easy to adjust even while you're in the seated position. Seat: Features At-Your-Fingertips Resistance Controls found on our most engaging club version is located on the sidebars to let you easily adjust your workout intensity throughout your exercise. Accessories: Customization options are determinant upon console selection. The Engage 15" console features iPod compatibility (Audio and Video), integrated TV entertainment console, virtual trainer. through USB connectivity, Workout Landscape™ perspectives and more. 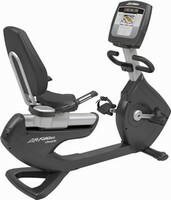 Click the button below to add the Life Fitness - Platinum Club Series Recumbent Cycle (INSPIRE Console) to your wish list.